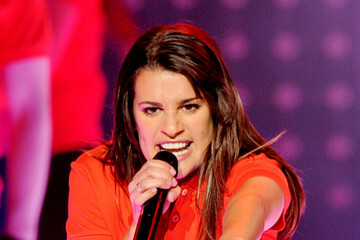 Lea Michele and Corey Monteith Are Leaving Glee. 2011 in Los Angeles, California. Lea Michele (Getty Images) The show must go on, but it's officially over for Lea Michele, Corey Monteith and Chris Colfer. After the upcoming third season of Glee, the singing/dancing trio will no longer star on the Fox hit show, creator Shawn Murphy has confirmed. This isn't a typical case of troubled Hollywood politics or salary disputes, though. Murphy told the Hollywood Reporter that their run is over because the actors' characters – Finn Hudson, Rachel Berry and Kurt Hummel – will be graduating from McKinley High School. While now-dated series like Dawson's Creek and One Tree Hill have attempted to craft compelling post-high school story lines, Murphy would rather keep his show in real time. He said about the mutual decision for the actors' departures: "I think they felt that it would be great to have an open and closed experience for them to go out while they were on top. It will be very sad for me to see them leave. But it's good because we're writing to something so powerful, which is those two beloved characters going off and hopefully getting their dream." Another important point to remember: Monteith is about to turn 30 and Michele is 25, so there's a short shelf life for how long they can pull off looking like teens.